Come down with a bad case of FOMO? Spoil yourself with a holiday in Sydney Central Business District. Situated 0.3 kilometres from the centre of Sydney, it's one the best places to stay while discovering New South Wales' capital. If you have a thing for ticking off bucket-list attractions, Sydney won't let you down. A visit to Bondi Beach, Sydney Opera House and Sydney Harbour Bridge will give you some serious bragging rights. 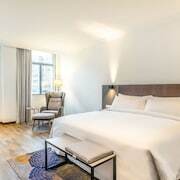 If you're keen to bunk down for the night near the Sydney Opera House, suss out the Park Hyatt Sydney, Pullman Quay Grand Sydney Harbour, The Darling at the Star, Quay West Suites Sydney and Establishment Hotel. Head over to Steyne Park and admire this leafy green retreat, nestled right in the heart of the city. You'll find a few hotels within close reach. 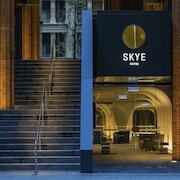 The Adina Apartment Hotel Sydney Surry Hills and Ovolo Woolloomooloo are terrific spots to throw down your suitcase. Paddington Markets is a vibrant place to grab some bargains or just enjoy the activity. Do you need somewhere to turn in near here? 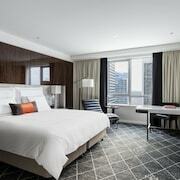 The Langham, Sydney and Fraser Suites Sydney are favourites with many visitors. You won't have to battle with stupidly thin pillows and mysterious bumps in the night when you lock in a ripper deal at the Sydney Central Inn - Hostel and Westend Backpackers - Hostel. Here at lastminute.com.au, cheap doesn't have to mean nasty. 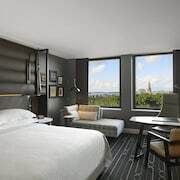 You definitely don't need soft towels, an enticing room service menu and plush cotton sheets all of the time (that said, it's nice to splash out every now and then, right?). 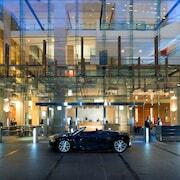 The elegant options here are the APX World Square and Hilton Sydney. Don't tear your hair out if you can't find the ideal Sydney Central Business District hotel deal. You'll find more accommodation options nearby. Sydney is 0.3 kilometres from Sydney Central Business District, and Castlereagh Street is 0.4 kilometres away. There's nothing like stepping off a plane into a new and exotic place. Flights, hotels, experiences, rental cars — whatever you need, we can make it happen!